Hockey isn’t the only sport that’s come up aces for Sam Reinhart. Before he settled on hockey as his No. 1 sport, Buffalo’s 23-year-old centre was holding court on as a hard-hitting lefty that netted his share of hardware playing tennis. Reinhart has plenty of reminders of his past tennis triumphs, including some impressive wins during his high school days in Vancouver. Tennis wasn’t the only sport Reinhart excelled in. He also played baseball, soccer and lacrosse before hockey became the primary focus. The Sabres are certainly glad he opted for hockey. 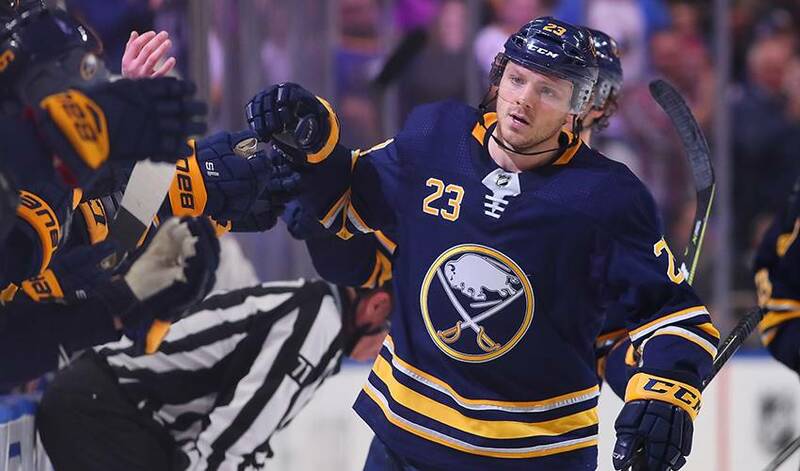 Reinhart, who made his NHL debut on October 9, 2014, against the Columbus Blue Jackets, became the sixth-youngest Sabres player in history, at 18 years, 338 days. His first NHL point, an assist, came 16 days later against the San Jose Sharks. He scored his first NHL goal on October 17, 2015, against the Tampa Bay Lightning. In 2015-16, he scored 23 goals and joined Jack Eichel (24) as the first Sabres rookie tandem to record 20-goal campaigns since Danny Gare and Peter McNab in 1974-75. These days, Reinhart and his teammates have their sights set on an Eastern Conference playoff spot. Buffalo’s last post-season appearance came in 2010-11. For now, any thoughts of reliving his tennis glory days aren’t on the radar.